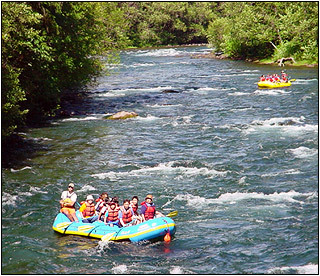 Thank you for your interest in rafting with Oregon Whitewater Adventures (OWA). 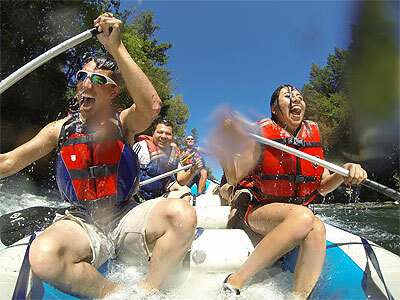 Rafting trips are available from April through October. Trips are paddle trips, where everyone participates by paddling, unless otherwise requested. If requested, the guide will row the raft, and you sit and relax while the guide does the maneuvering. No experience is necessary! An expert whitewater guide will teach you paddling techniques and river safety while guiding you downriver. Even nonswimmers will feel confident and secure in Coast Guard approved life jackets. Top quality personal flotation devices (life jackets) are provided and must be worn at all times while on the water. At the beginning of your trip, your guide will give you a safety lecture. All guides are experienced, friendly, and have first aid training. Day trips include a delicious, hearty deli-style lunch. Overnight trips include deluxe meals from lunch on the first day to lunch on the last day of the trip. Dutch oven cooking is featured on the camping trips. Guests with special dietary or medical needs should inform us before the trip. All customers will be met at a pre-designated meeting place at the river. Free shuttle service, unless otherwise indicated, will be provided to/from guest's cars. 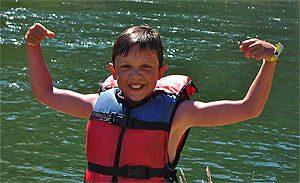 Minimum age on river trips is six years old (ten years old on the Umpqua). Please notify us in advance of children under 100 pounds so children's life jackets will be provided. On overnight trips, guests who wish to bring alcohol in unbreakable containers for camp are welcome to do so. It is our firm policy that alcohol will not be consumed on the rafts. Fifty percent deposit of the trip charge is required within two weeks of your phone reservation. The balance is due two weeks prior to the trip date. VISA and MasterCard and American Express are accepted. Please call our office for information on Gift Certificates. Deposits are 100 percent transferable to another trip with 30 days notice prior to the trip date. If cancellations are made less than 30 days prior to the trip, no monies will be refunded. OWA reserves the right to cancel trips in the event of unsafe river levels and hazardous weather conditions, whereupon a full credit will be given. However, we do not cancel trips due to inclemet weather; ensure a comfortable trip by following recommendations on the personal gear list. OWA is not liable for injury or loss of any gear. Customers will be required to sign a liability release before their trip.